[281 Pages Report] The global polymer coated fabrics market was USD 17.38 Billion in 2016, and is projected to reach USD 26.92 Billion by 2026, at a CAGR of 4.2% from 2016 to 2026. In this study, 2015 has been considered the base year, and 2016 to 2021 the short term forecast period, and 2016 to 2026 the long term forecast period to estimate the global market size of polymer coated fabrics. The polymer coated fabrics value chain includes polymer coated fabrics manufacturers such as Takata Corporation (Japan), Trelleborg AB (Sweden), Spradling International Inc. (U.S.), Serge Ferrari Group (France), Saint-Gobain SA (Switzerland), Sioen Industries NV (Belgium), Continental AG (Germany), Takata Corporation (Japan), Cooley Group Holdings, Inc. (U.S.), Dickson Constant (France), Seaman Corporation (U.S.), and SRF Limited (India). Polymer coated fabrics are majorly used in the transportation, protective clothing, industrial, roofing, awnings & canopies, furniture & seating and other applications. “Thisstudy answers several questions for the stakeholders, primarily, which market segments they should focus upon during the next two to five years to prioritize their efforts and investments”. This report categorizes the global polymer coated fabrics market based on products, applications, and regions. The global polymer coated fabrics market is projected to reach USD 26.92 Billion by 2026, at a CAGR of 4.2% from 2016 to 2026.The global polymer coated fabrics market is driven by the increased demand from end-use applications such as, transportation, protective clothing, industrial, furniture & seating, roofing, awnings & canopies, and others including geotextiles, packaging, sports & leisure, agriculture, and medical. Polymer coated fabrics are anti-static, antibacterial, and anti-fungal in nature and offer advantages such as enhanced elasticity, high visibility, weldability, and resistance to flame, UV radiation, chemical, oil, water, stain, scratch, and abrasion, among others. Vinyl coated fabrics account for the largest product type in the global polymer coated fabrics market. 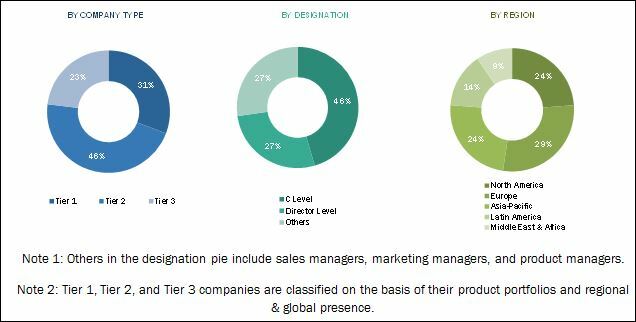 The global polymer coated fabrics market is segmented into vinyl coated fabrics, polyurethane (PU) coated fabrics, polyethylene (PE) coated, and other polymer coated fabrics. Other polymer coated fabrics include acrylic, nylon 6, nylon 6-6, polyamide (PA), polycarbonate (PC), polyether ether ketone (PEEK), polybutylene terephthalate (PBT), and polyethylene terephthalate (PET). The global market for polymer coated fabrics is estimated to witness high growth owing to the increasing usage in various applications due to its reduced cost, easy weldability, and availability in a range of colors. Transportation is estimated to be the fastest growing application of polymer coated fabrics. The transportation segment is projected to drive the polymer coated fabrics market from 2016 to 2021 due to the increasing usage of polymer coated fabrics in the automobile, aircraft, railways, and marine applications. The automotive industry is growing at a high rate since its revival, post the financial meltdown in 2008. In the automotive industry, safety is a crucial consideration for car manufacturers. Polymer coated fabrics are appropriate for a wide range of automotive end-uses such as interiors, exteriors, air bags, seat belts, and truck tarpaulin & covers, boat seating, boat topping, rafts, and kayaks. The automotive industry is already growing at a high rate, which is expected to drive the global market of polymer coated fabrics during the forecast period. The Asia-Pacific region is the fastest-growing market for polymer coated fabrics in terms of value and volume, globally. Growing industrialization backed by infrastructure development has offered high growth opportunities for the polymer coated fabrics market in the Asia-Pacific region. 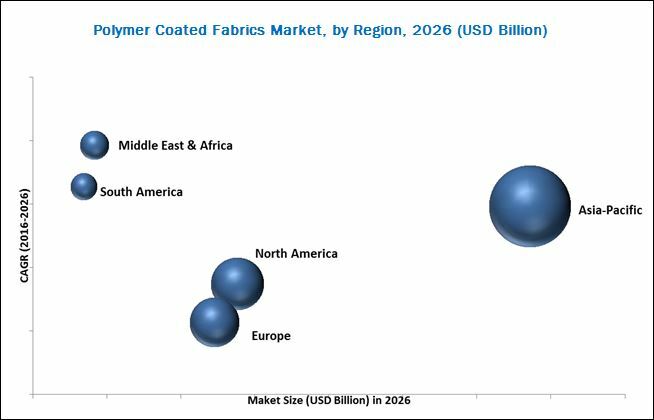 The increasing economic growth rate, and heavy investments in industries such as oil & gas, automotive, infrastructure, chemical, and steel & military, drive the polymer coated fabrics market in the region. Environmental concerns relating to the use of solvents in the production of polymer coated fabrics, and the availability of substitutes are restraining the growth of the market. New product launches is the major strategy adopted by the key players in the market. Companies such as OMNOVA Solutions Inc. (U.S.), Takata Corporation (Japan), SRF Limited (India), Serge Ferrari (France), Mount Vernon Mills, Inc. (U.S.), Cooley Group Holdings, Inc. (U.S.), Seaman Corporation (U.S.), Dickson Constant (France), Continental AG (Germany), Spradling International Inc. (U.S.), Trelleborg AB (Sweden), Uniroyal Engineered Products LLC. (U.S.), and Morbern, Inc. (Canada) are the key players who have adopted this strategy to increase their product offerings, customer bases, and to strengthen their market shares. Companies are investing in research & development activities and introducing new products to keep up with the changing consumer needs.